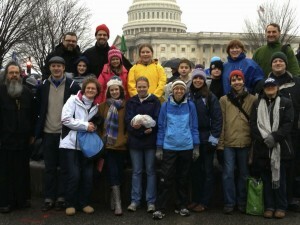 Answering a call from the Holy Synod of Bishops, strongly encouraging all clergy and laity to attend, Holy Trinity will provide free transportation to the 41st March for Life in Washington, D.C., on Wednesday, January 22. The trip is being coordinated by our campus and Sunday School ministries, and all are welcome to travel with us. The rally is held on the National Mall beginning at noon. This year our group will park at nearby Union Station so we can immediately meet up with our fellow Orthodox Christians participating in the peaceful demonstration. We will join them in the march up to the Supreme Court where a prayer service will be led by Metropolitan Tikhon. Holy Trinity’s two 15-passenger vans will depart from the church parking lot promptly at 6 a.m., and return at 10 p.m., stopping each way at the Sheetz in Duncannon at 7:30 a.m./8:30 p.m. to pick up and drop off Chapel members. Participants should wear warm clothing, pack a lunch, and bring money for a dinner stop on the way home. RSVPs to info@holytrinity-oca.org by Wednesday, January 16 are required.